There you are, standing at your bathroom sink while you brush and floss. You’re not thinking of anything in particular, maybe going over your to-do list for the day or thinking about what to have for dinner. But then you see it – blood in the sink again! Just what is going on with your gums and why are they bleeding? 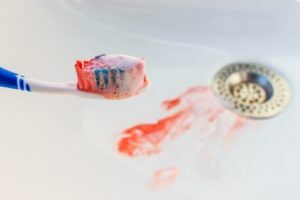 You’ve probably heard that bleeding gums can be a sign of gum disease, but you may not be sure exactly what that means or what you can do about it. This article will explain why your gum health is so important and how you can take steps to improve it. Inadequate Hygiene – If your brushing and flossing aren’t effective, you’re leaving behind bacteria that can infect your gums and cause inflammation. Bleeding, tenderness and swollen tissues are all signs that your gums are inflamed. Periodontal (Gum) Disease – If you have periodontal disease, chances are you have deeper “pockets” around each of your teeth. This can result in bacteria getting deeper into the gums where your toothbrush and floss can’t reach. Certain Medications – Some medications will thin the blood, which means that you can bleed (and bruise) much easier than before. Pregnancy – Changes in hormones can cause the gums to bleed, even if you’re doing your best with brushing and flossing. How Can Gum Disease Affect You? The health of your gums is important for your oral health as well as your overall health. First, your gums are what give your teeth the support and stability they need to function properly. In advanced stages of gum disease, the teeth can become loose and fall out, even if they’ve never had a cavity! Second, researchers have found a lot of evidence in the last 20 years or so that inflammation of your gums can increase your risk for heart disease, stroke, cognitive decline, diabetes and pregnancy complications. As it turns out, flossing is good for your entire body! What Can You Do To Improve Your Gum Health? Thankfully, there are some easy steps you can take to improve your gums. First, schedule an appointment with your Weatherford dentist. They’ll be able to examine your gums and let you know if you have gum disease or not. They’ll also give you a professional cleaning that will remove the plaque and tartar from under your gumline where you may not be able to reach. If you do have some form of gum disease, your dentist will review your options for treatment, including periodontal therapy. There are several non-surgical types of therapy that can dramatically improve the health of your gums, including deep cleanings, laser treatments and antibiotics. Lastly, your dentist will be able to give you detailed oral hygiene instruction to help you make the most of your time brushing and flossing. What you do at home is just as important as the professional treatments you get. Remember – you and your dentist are a team working together to give you the best possible oral health! Dr. Deborah Romack and Dr. Garrett Mulkey are passionate about providing their patients with gentle, highly skilled dental care. They especially love to educate patients about the importance of gum health and what they can do to have healthy gums for life. They can be reached for questions via their website or at (817) 594-3806.
by: Dr. Deborah Romack at March 2, 2018 .